Four years ago, Belmont Private Hospital’s Adjunct Associate Professor Sandy Sacre met with Alison Marland, clinical externship co-ordinator, from Griffith University’s School of Applied Psychology in Brisbane to explore opportunities on how Belmont could extend its training to provisionally registered psychologists requiring placement and practicum hours, while allowing them the opportunity to actively engage with Belmont therapy programs and the overall hospital services. Belmont Private Hospital became involved with Griffith University’s Clinical Externship program from the start of 2011, as part of its Post Graduate Clinical Psychology program, where the goal is superior academic performance, matched by personal attributes and skills. There are 20 places offered in the postgraduate Griffith Clinical Psychology program each year and these are chosen from around 200 applications received from Honours graduates around the world. Through the Clinical Externship program, students are placed throughout the greater Brisbane, Gold Coast and Sunshine Coast areas. Around 25 per cent are placed at Belmont Private Hospital, due to extern demand for multidisciplinary and acute care field exposure. The program allows externs, all provisionally registered psychologists, to complete their required placement and practicum hours consisting of two days per week over 20 weeks, after a one-year intensive training internship at the Griffith University Clinic. 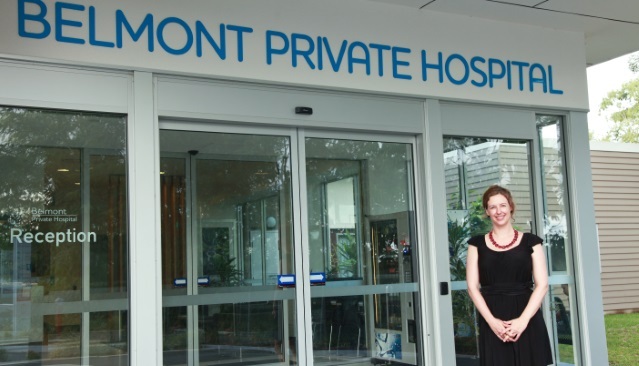 Around 10 externs from Griffith University (as well as externs from QUT) are placed at Belmont Private Hospital each year. According to Ms Marland, the work of Ms Sacre and the Belmont Private Hospital team is “exceptional”. “It is a structured and supportive placement with very clear guidelines. Further, it provides learning and breadth across many mental health presentations – from anxiety and depression to the more complex end including postnatal depression, trauma and dissociative disorders and intensive care in the hospital’s Special Care Unit. “Belmont is one of the preferred placements for our students due to the breadth of learning and field experience it provides. Students are truly valued as part of the multidisciplinary team, allowing them to grow as professionals,” she added.